The round-robin Georgian Championship which gathered 12 participants has finished in the capital of Georgia. Baadur Jobava, the rating favourite gathered 9 points out of 10 and assured the 1st place one round before the finish. 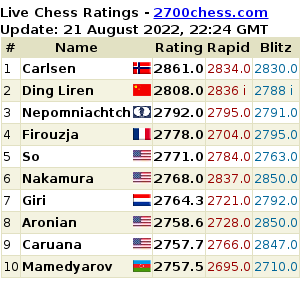 His nearest rivals Merab Gagunashvili and David Zarkua have 7 points each. In the penultimate round Jobava, who was 1.5 point ahead of his rivals, gained a confident win against Luka Paichadze. The opponents have just passed the opening stage of the game, but White's inaccurate transition of the knight to е2, was followed by a surprise: 15...Rxf3! 16.gf e5, and Paichadze didn't manage to cope with the complications. The position is of course from the Sicilian defence. 25.Qxf5! Not the only, but perhaps the most comfortable decision 25...Qxf5 26.Rxf5 Bxd1 27.Bxd1, and Black can't convert its small material advantage. The favourite demonstrated his technical skills till the very end of the game. Take a look at all games of the tournament. The Georgian Men's Championship has started in the Tbilisi Chess Palace on 13 May. This time, the strongest chess player of the country is decided in an all-play-all with twelve participants. Last year the Championship was held as a knockout and the winner was a little known chess player and a rating outsider Davit Zarkua. Azerbaijan Outplayed Georgia Confidently. Georgian Coach is Not Discouraged "Guys Stood Good"
A friendly match between Azerbaijan and Georgian teams have finished in Tbilisi, Georgia. In the last round the guests made 4 draws and even lost one game. the overall score of the match is 14.5 - 10.5 in Azerbaijan's favor. The head coach op Georgian team Xvicha Supatashvili is not discouraged: "Guys stood good in a lot of games, however, the result was opposite!" Dmitry Jakovenko of Russia beat French GM Laurent Fressinet to win EICC with 8.5 points out of 11. 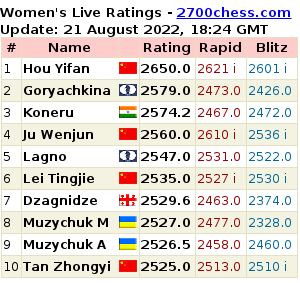 Other decisive games of the last round ended in draws, so none of the players was able to catch Jakovenko. Georgian based Grandmaster David Arutinian won the 5th Karen Asrian Memorial held in Jermuk, Armenia. Arutinian scored 7.5 out of 9 and took clear first. Avetik Grigoryan, Artashes Minasian and Levon Babujian gathered 6.5 each. The rating favourites Hrant Melkumyan (2642) and Zaven Andriasian (2615) scored only 5.5 and 6 points. After 4 rounds of the traditional Swiss format tournament Cappelle La Grande, France two players have 100% result, Armenian GM Tigran L. Petrosian and Bassem Amin of Egypt. The leading grandmaster of Belarus Sergei Zhigalko has won against the rating-favourite Boris Grachev in the penultimate round of Nakhchivan Open and levelled on points with Viorel Iordachescu (who drew against Eltaj Safarli, as we reported earlier). The traditional monthly festival First Saturday took place in Budapest, Hungary. As usual, the participants were trying to fulfil different norms in several round-robin tournaments. Christian Bauer leads in Nancy, France with 3 points out of four rounds. Alberto David chases the leader with 2.5 points. Ivan Sokolov and Romain Edouard gathered 2 points each, while Chanda Sandipan has 1.5. Yuri Solodovnichenko closes the table with one point. Take a look at the games of Round 3 and 4.